I argue that the anxiety and change in the workplace, while it could have stifled pride, did the opposite. The tenuous position of the occupation and of its social status -- for young migrants, for artisans, for professionals -- led to pride, albeit a desperate kind of pride, in occupation. I argue especially for this view in the case of artisans -- they saw their ways of living, and their crafts, disappearing, and responded by having portraits taken of themselves surrounded by their tools and their products. 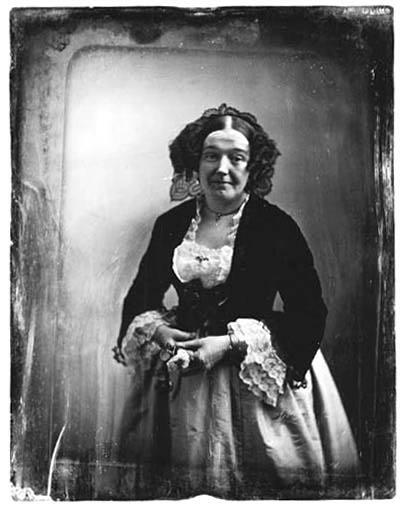 Several genres of representation, in painting and in photography, can be seen as contributing to the development of the occupational daguerreotype. In discussing these, I do not intend to imply a simple temporal progression; the styles that I discuss existed simultaneously, more or less. I do, however, argue for some kind of causal relationship. The conventions and cultural forms that these paintings and photographs display were transferred from genre to genre, and those forms shifted, in the process, toward the pride and individualism of the occupational portrait. 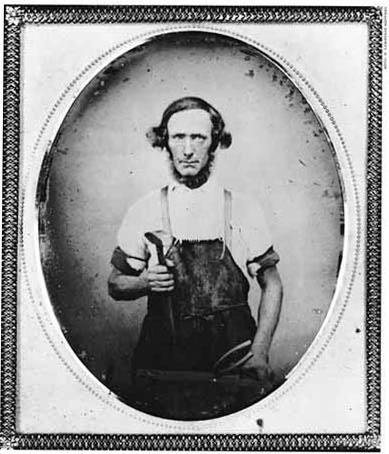 Like this daguerreotype, the genre painting of the poor rural worker was sentimental and condescending, often showing workers, black and white, engaged in mindless play. 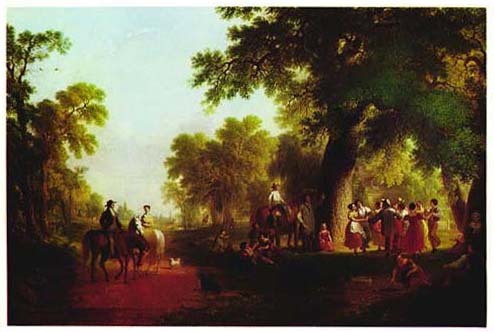 Take, for example, Asher Durand's Dance of the Haymakers (Figure 16), which includes the landlord and his wife, on horses, watching their employees from a distance. The condescension of our gaze at the oblivious subjects is doubled by the presence of upper-class watchers in the painting itself. 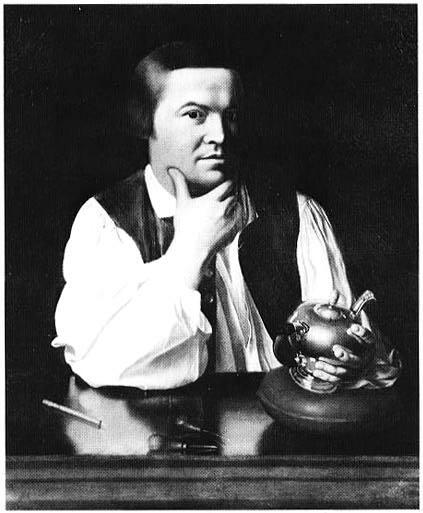 Before commissioned daguerreotypes of Americans at work became widespread, the genre had to develop conventions that showed respect for the subject, and it did, adopting the pride of the Revere portrait in Figure 15; the pride of a subject who is aware of his viewers, and looks back at them. An intermediate category that fulfilled this requirement emerged as well: a genre of a documentary work photographs. These photographs, taken, largely, in California and other parts of the west, used many conventions of the occupational portrait, though they were driven by different impulses. While the documentary quality of these photographs is paramount -- they are the ancestor of the documentary photographs of our century -- there is also a sense of pride and individualism that is missing from genre painting and its photographic equivalent. 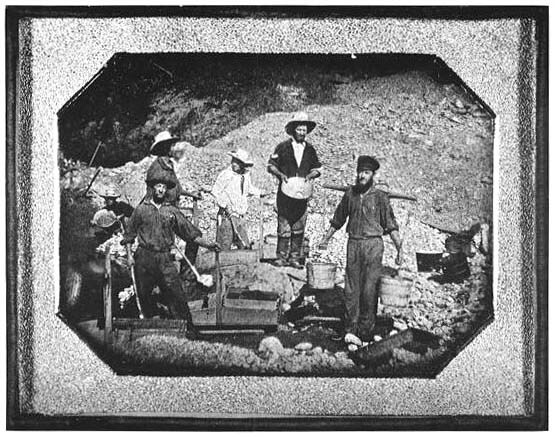 For our example, we take an anonymous photograph from around 1852 of California gold miners at work (Figure 19). Like genre paintings, the photograph professes to have caught the miners in the middle of their work, in a typical moment. Here, however, the photographer has taken special care to show each stage of the mining process, with each subject carrying a different tool. In a very conscious way, the photograph constructs a picture of the mining process that oversteps the temporal bounds of the photograph. In a single moment, it portrays an entire day. The photograph can also be distinguished from genre paintings by the relationship of the subject to the camera and the audience. Unlike the oblivious subject of a genre painting, and of the closely related "fictional" photograph, the miners in this photograph confront the audience, full of pride in their work. The sense of dignity that this sort of photograph gave to the worker was augmented when the photograph was a commissioned portrait; the independent, "republican" artisan could exert direct control over his representation. This control was illusory in part, of course -- the subject was at the mercy of the daguerreotypist and the conventions that he maintained -- but it was a powerful symbol nevertheless. 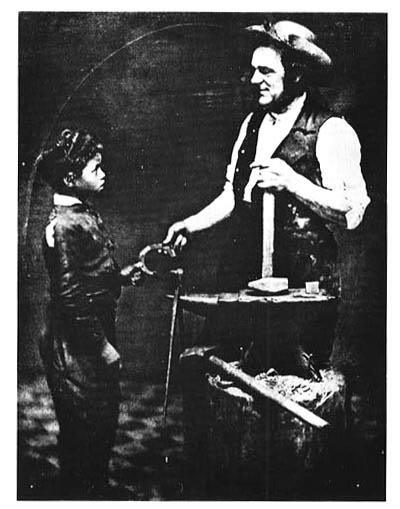 The photograph in Figure 20 is a typical artisan portrait. The toleware (a form of intricate metalware) maker is pictured clothed in his traditional apron, holding a product of his labors and one of his tools. The vague, superficial convention is, as it is in the photograph discussed above, that we have caught the toleware maker in mid-work in his studio -- he apparently lugged a great deal of his work to the daguerreotypist's studio for an extra level of realism -- but this convention, unlike the mining portrait, is not expected to actually fool anyone. The convention is simply accepted as "accurate" in a certain way: as depicting the typical, everyday moment of the toleware maker, and in the process, the essence of the worker. The display of toleware has two functions in addition to creating the illusion of the workplace. Like the mining portrait, the various objects create a sense of the passage of time, as the artisan has moved from product to product. Their primary function for the subject, though, was probably the expression of occupational pride. Finally, we turn to a subtle but crucial issue of the occupational daguerreotype: gender. Any conclusions we draw about women's occupational daguerreotypes are suspect because there are so few examples of them. Our first conclusion might be based on that point alone; the daguerreotype represented women as they were perceived: socially or domestically, but not as workers. 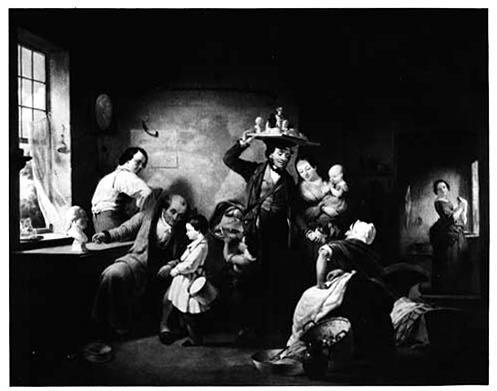 The most common occupation that is represented, of course, is motherhood, either implicitly, as with the mother and child portraits discussed in chapter two, or more bluntly, as with a single, fascinating photograph of a woman breast-feeding a baby (see Figure 23). 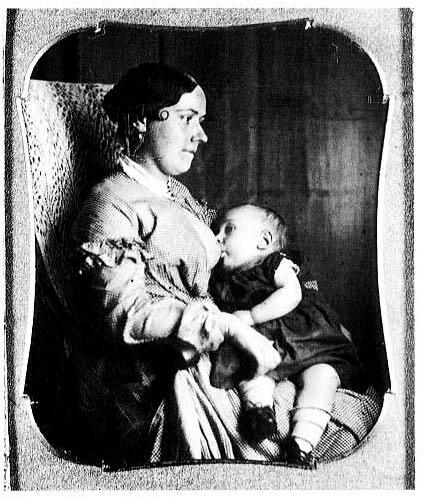 Was this a spontaneous "snapshot," with the baby deliberate enough at her mother's breast that an exposure could be made? Or was it an intentional construction of the mother's role? The second, even more rare category of women's occupational portraits is represented by Figure 24, a Southworth and Hawes portrait of the Boston actress Mrs. James R. Vincent. In certain, subtle ways, the portrait may represent her career as an actress; she is standing, her expression is more emotive and less dreamy than most female portraits, and the flower in her hand could be a prop or a post-performance bouquet. However, while the portrait does not specifically place her in a domestic setting, it avoids, too, placing her in a professional one; the portrait avoids the issue of her ambiguous status, somewhere between wife (her own first name is nowhere to be found) and actress. 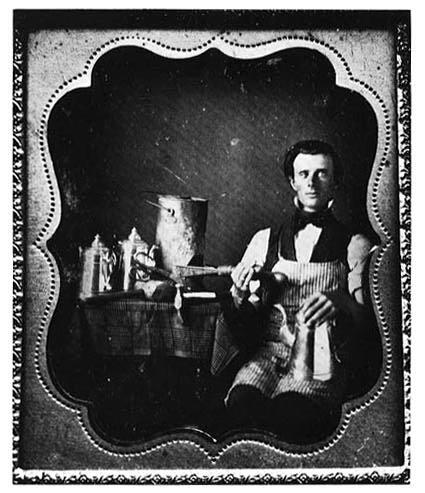 The issues in reading an occupational daguerreotype are complex and elusive to the point of confusion; so, too, were the self-images they represented. Issues of occupational pride, for most people, collided with issues of social standing; only artisans, who were threatened with extinction, seemed to have a clear sense of how they wanted to be portrayed. In an age dominated by the private, domestic world of the middle class, the occupational portrait stands as testament to the world that was being displaced, one in which a man's job was his identity. 1. This is not self-evident. The drive to represent oneself at work might be universal (as least as far as portraiture is) -- after all, nearly everyone spends a good portion of their lives at work. In fact, though, the late twentieth century, an easily accessible example, is devoid, more or less, of the conventions of the occupational portrait. 2. Brooks Johnson's "Progress of Civilization," (in Wood, 1991, pp. 115-117) suggests that a young man who had worked at many occupations might want to preserve a "memento" of each one "for a fascinating evening of conversation." This seems a superficial and unconvincing explanation; the care taken and pride displayed in posing the occupational daguerreotype suggests reverence, even passion. 3. Susan E. Hirsch, Roots Of The American Working Class (University of Pennsylvania, 1978), pp. 3-15, and Sean Wilentz, Chants Democratic (New York: Oxford University Press, 1984), pp. 61-103. 4. Hirsch, Roots, pp. 15-37, and Wilentz, Chants, pp. 107-142. 5. On this point, see also Nathan O. Hatch, The Democratization of American Christianity (New Haven: Yale University Press, 1989). 6. Samuel Haber, The Quest for Authority and Honor in the American Professions, 1750-1900 (Chicago: The University of Chicago Press, 1991), pp. 91-116. 7. See Hermann Warner Williams, Jr., Mirror To The American Past; A Survey of American Genre Painting: 1750-1900 (Greenwich, CT: New York Graphic Society, 1973). 8. Other examples of this genre include the 1853 The Woodsawyer's Nooning, by George N. Barnard (Rudisill, Mirror, plate 95) and, in a scornful portrayal of a young man who is probably not going to church, J.T Harrison's The Young Bachelor's Sunday Morning, 1857 (Rudisill, Mirror, plate 94). 9. For other examples, see Shimshak, Power, plate 51, and Wood, America, pp. 110-116. 10. There are far fewer middle-class occupational portraits than portraits of artisans at work, because, presumably, middle class men were satisfying their need for self-representation with domestically styled portraits, and avoiding the difficult issues that this man confronted. There are, however, a few examples of middle-class occupational photographs that portray a hobby -- e.g. hunting (Rudisill, Mirror, plate 119) and butterfly collecting (Rudisill, Mirror, plate 137) instead of a job; we can hypothisize that these activities were more compatible than the occupation with a domestic middle-class persona. 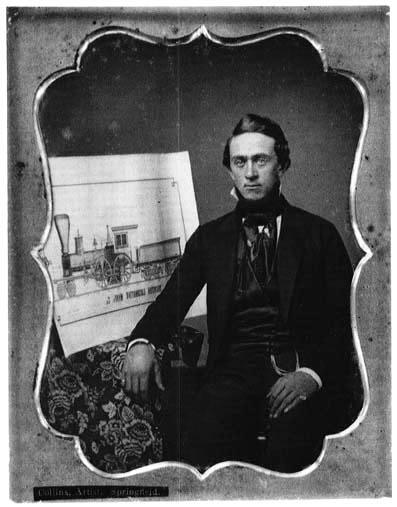 For other examples of standard occupational daguerreotypes of the middle class, see Rudisill, Mirror, plate 110, and Shimshak, Power, plate 69. 11. The clown is in Wood, America, plate 11. Similarly, see the fireman in Shimshak, Power, plate 14.